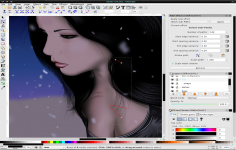 Inkscape is a program specially designed for editing or creation of vector graphics. The format used by the application is a W3C standard, SVG. It offers a large number of elements recognized by this format : basic shapes , paths, clones , transformations, Boolean operations , gradients , groups , layers. The basic functionalities of this standard are available as adding text, creating forms, duplication, transparency, changes or gradients. 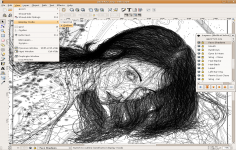 However Inkscape provides interesting tools such as support for metadata Creative Commons, layers, complex paths, etc. The application also allows the import of documents in EPS, Postscript, JPEG, PNG or TIF. The backup will be in PNG format or other, depending on the future use of each image. 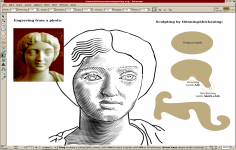 Inkscape offer the possibility to create web pages: the text can be added in the drawings for the information or descriptions and formatting Text varies according to needs of the user. The interface is developed using the GTK libraries, popular Linux. This choice facilitates porting an operating system to another. Inkscape 0.92.4 is a stability and bugfix release. It also brings some notable performance improvements for filter rendering, measure tool, saving and moving paths (with a live path effect) and includes a couple of small, but impactful usage improvements.